Come to Our 10th Anniversary Celebration! 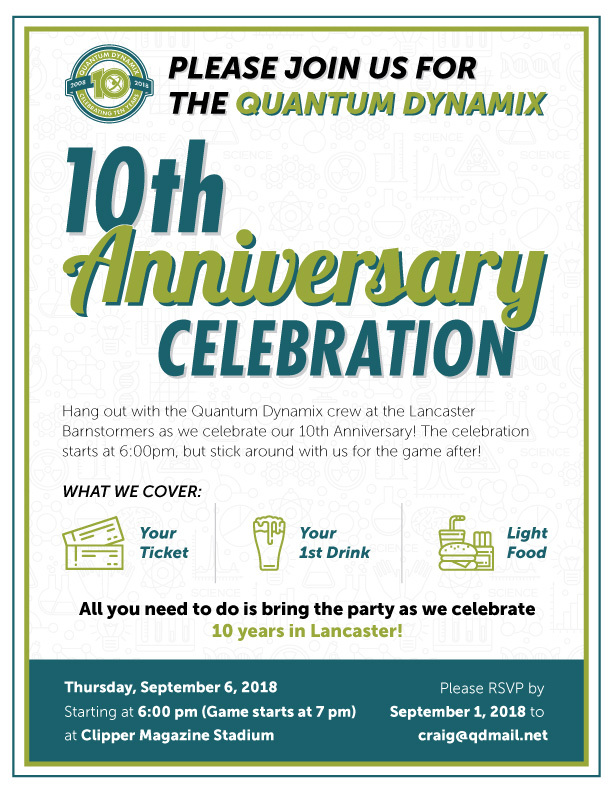 For 10 years Quantum Dynamix has been a part of the Lancaster, PA community. We started as a small website development firm, but your support has helped us grow into the full-service comprehensive digital marketing agency we are today. To celebrate our 10th Anniversary, you are invited to the Quantum Dynamix 10th Anniversary Celebration. The event will be held at Clipper Magazine Stadium, home of the Lancaster Barnstormers, on Thursday, September 6, 2018. As a thank you for your support over the last decade, your Ticket to the game, Light Food, and First Drink are on us. All you need to do is RSVP and bring the party as we celebrate 10 years in Lancaster! The celebration starts at 6:00pm but stick around with us for the game after. The Barnstormers will be playing the Somerset Patriots starting at 7pm. We would love if you and your team could join us for this special evening. Please RSVP to craig@qdmail.net by September 1st so we can look forward to your arrival. Thank you and see you on September 6th!